I bought this wheel the week before Christmas 2004 but after not even a day's playing it had a few problems (yes, it wheely did) so i took it back to the shop i bought it from and swapped it for a slim PS2 and Grand Theft Auto: San Andreas and got $1 change! Was a wee bit harder to drive cars in GT4 with the San Andreas disk and the coin, but somehow i managed. Don't get me wrong though - this wheel is supremely awesome and well worth the money. 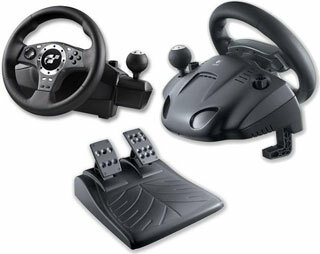 It was made by Logitech especially for Gran Turismo 4! I'M NOT JOKING. HW KOOL IZ THT? IT'S LIKE, ANTARTIC FREEZER WITH BAGS OF ICE KEWL! PLUS REALLY REALLY SOMETHINGELSEREALLYCOLD TOO! Bear in mind i've only used the wheel in Gran Turismo 4: Prologue - but apparently it is better in GT4! If you say it, i'll believe it! - Grab the comfortable grip and turn the wheel two and a half times from lock to lock, just like in a real car. Available in supported games only. - Automatically restricts the rotation of the wheel to 200 degrees of rotation in games that do not support 900 degrees of wheel rotation. - Feel the road, bumps, gravel, walls, and other effects in games. Logitech's latest force feedback technology delivers greater realism compared to previous force feedback products. - Steel bearings support the main shaft to provide smooth, accurate steering with minimal lateral movement. And an optical sensing system encodes all steering movement with digital precision. - Shift gears up or down conveniently with easy-to-access shifters. Or use the paddles as L1 and R1 buttons and the shifter as L3 and R3 buttons. - The 8-way D-Pad and four PlayStation® action buttons (circle, square, X, triangle) give you convenient control of menu selections, view changes, car control functions, and other standard directional pad controls in driving games. Four secondary action buttons (L2, L3, R2, R3) act as L2, L3, R2, and R3 buttons of standard PlayStation®2 controller to be used for a variety of car control functions such as horn, lights, and wipers. Select and start buttons are also conveniently located on the wheel front. None of the buttons are analogue though like the PS2 controller! 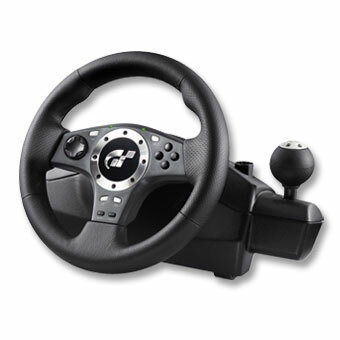 - For optimum control, you need the wheel tightly locked down on your desk or table. The dual clamping system keeps the wheel base secure, but it's also easy to tighten and loosen for quick installation and removal. - The pedals add to the realism and precision of your driving experience. And the exclusive carpet grip system features special teeth to prevent the base from sliding around. The system retracts for use on hardwood or other smooth floors. - The USB port connection makes for easy plug-and-play operation. And status indicator lights tell you when wheel is powered up and calibrated, and also when the wheel is in 200 or 900 Degree Steering mode. I got the boys at Harvey Norman to set up the wheel and GT4: Prologue a few Sundays ago (like, years worth of Sundays ago). They also grabbed a desk to mount the wheel on and a chair to sit on (for me, not them - although one of them did watch me and no doubt tried to refrain from laughing). I love the design of it for starters. Compared to all the other ones there it was the only one with a rubber wheel thingy (which felt really, really solid). Loved the little 'GT' logo in the center of the wheel. It said it loves me too, but i don't swing that way. Despite just saying the contrary. Wish the accelerator and brake pedals were a little harder to press down, but in saying that they weren't 'that' loose - the brake pedal being noticeably tighter. The paddle shifters, i found, were a lot easier to use than the gear lever thingy and i got the hang of them right away. The wheel itself however... Dot dot dot indeed. By crikey George. The guy put it up to the most feedbacky (if i say its a word, then ... it probably isn't) mode and chose the EVO VIII around Grand Canyon. He crashed it into the wall at the first corner and handed it over to me. I made it as far as the big hairpin (not going to mention how many spins/half spins/tank slaps/wall hits i did) and then he decided to down the feedback level a bit (which i agreed with!). We just weren't man enough (well, i was a Tyrannosaurus Rex back in the day though, so i simply ate man/woman instead of being a man). Once he put it on 'medium' the next victim was the R34 Skyline GT-R NuR at FISCO (or Fuji if you like. Do you like? You do like. I like that you like. Like, totally. OMG.). I didn't notice traction control was on until the second lap - which is why none of my powerslides worked (seriously easy to initiate them with a wheel though - and a massive amount of fun). I could easily brake/accelerate, change gears and turn but what i had trouble with most is any sort of countersteering. Because it would countersteer my countersteers while countersteering. I did the *exact* same thing with the GT-R in GT4:P as i did in my Dad's 4WD Nissan Skyline in 2003 ('tank slapped' up the road). I did a bit of opposite lock up the main straight, thinking it would be enough to start going straight again, but then it just snapped into 'tank slamming' on the other side (because i had turned the wheel a bit too much, like i did in real life) - seriously the same thing i did that year in the GTS-4. I can honestly say that this will improve my driving in real life. I'll now be able to tankslapp any type of car. Uh, i mean, the combination of Gran Turismo 4 and Driving Force Pro is just simply amazing. I HAVE TO GET THIS WHEEL!! Anyway. 900° mode? Woah. I was countersteering a slide onto the grass at one point (one of many, many, many, many, off track excursions) and turned the wheel a heck of a lot and never hit the steering lock! So i did another turn of the wheel and finally it stopped turning. And the force feedback is a little scary. It really 'jolts' the wheel with a force much like the person next to you being a wiseguy and turning the wheel the opposite way while you're using it. I was going up the main straight in the GT-R, looked away from the screen - felt a jolt - looked at the screen and was heading towards the grass after i ran over the huge peanut butter sandwich that was lying in the middle of the track. Either that or the wheel was trying to get me off the track at high speed which i think is very awesome. I truely can't believe the force (no pun intended) of the feedback in this wheel! If you try the wheel in a shop (while not connected to any game - just sitting on a shelf) then do not make the mistake of not asking to hook it up to GT4: Prologue (in PAL countries obviously). I thought the wheel was pretty average/crappy until i played it in GT4. My mind changed in the absolute quickest of milliseconds (even before i'd used it! Just watching it calibrate and turn 900° by itself was enough! Things fascinate me! Like pancakes! They are cakes that look like pans! Aren't they?). I'd give the wheel an 10/10 for sure. I think it is worth the price. I couldn't stop smiling the whole time i was using the wheel. Nothing to do with the botox injections i had. Logitech = Steering wheel gods. It does take a while to get used to (Dad tried it and said he thought it was very realistic too) but when you do, it can be SO much fun. When i was good enough i tried a Mitsubishi Lancer EVO IV Rally Car around Grand Canyon and for the most part i was doing pretty darn well (keeping off walls while sliding etc) and my countersteering had improved by then too. Only thing is that you'd need a table (not too thick otherwise you won't be able to attach the wheel, and not too thin or papa bear will squash it, it has to be just right so baby bear can use it) which you can fit your legs under (not a coffee table which i had to use, but a tea, or cocoa table might suffice) and a hard non-moving chair (not like a Lay-z-boy or sofa which i was using) so that you have the most control. Logitech = Still steering wheel gods. You can't say that it doesn't look awesome. No, i mean literally. It's against the law. In Atlantis.